Place the shrimp in a medium-sized pot, with 1/4 of the onion, two stems of cilantro and four cups of water. The shrimp will be completely cooked when the mixture begins to boil; they should be pink in color when removed. Save 1/2 cup of broth and set aside. Drain the shrimp and rinse in cold water. Chop the shrimp into medium sized pieces. In a bowl, combine the shrimp, lemon juice, half of the tomatoes, onion, peppers and diced cucumbers. Then sprinkle two tablespoons of finely chopped cilantro over the mixture. In a food processor, add the remaining half of the tomatoes, onion, peppers and diced cucumbers, with the garlic, olive oil and bolillo bread. Blend the ingredients well-the finished sauce will be fairly thick. Pour the finished sauce over the shrimp mixture, and lightly season with salt and black pepper. Cover the bowl with plastic wrap and refrigerate for at least one hour. To serve, accompany with sliced avocado and some croutons. Disfruta! To save time in the kitchen, you can use pre-cooked shrimp. 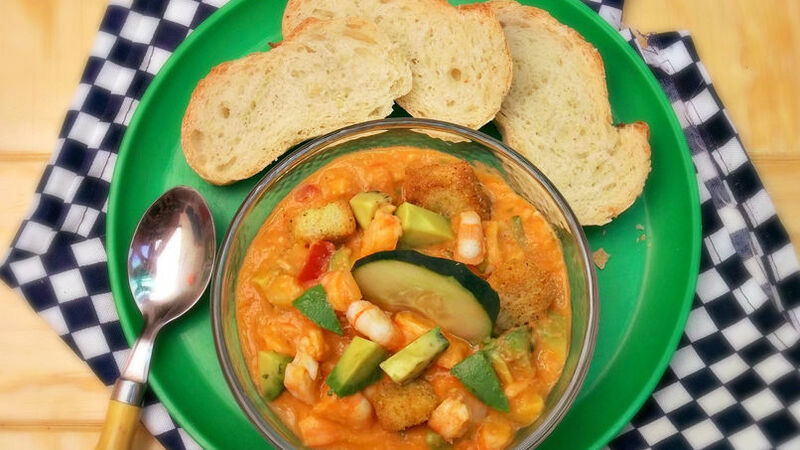 I don’t know why, but every time I prepare a ceviche or shrimp cocktail, I always think of a rico gazpacho. I think it’s because gazpacho can be prepared with many of the same ingredients: roma tomatoes (jitomate), cucumber, onion and chili peppers. That is why one day, I thought of combining a shrimp ceviche with gazpacho. Instead of adding all the diced vegetables to my ceviche, I puréed half of them plus the garlic, olive oil and a piece of bolillo bread. The result was a success and is now one of my favorite dishes for serving on a hot day.